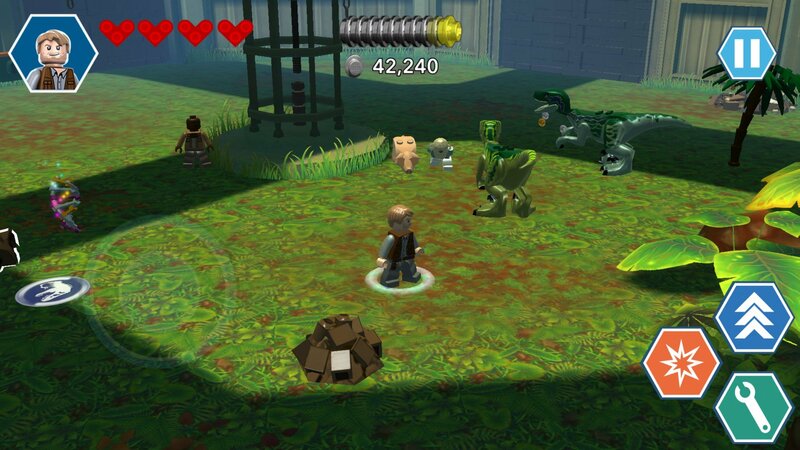 LEGO games on iOS are, by this point, nothing if not reliable. Apart from the earliest releases on the platform and the occasional experiment, the LEGO games based on licensed properties all essentially do the same things. They tell (or retell) a humorous story using a selection of stages from the console versions, offer up some mindless action gaming, and have a ton of unlockables. How much you enjoy them usually depends on how much you like the property involved, but all of the games kind of fall in that sticky zone that lay just between boring and interesting, and LEGO Jurassic World ($4.99) isn’t any different. Except, you know, that this one has playable dinosaurs. How excited does that last sentence make you feel, on a scale of one to ten? If you’re twitching in your seat right now in anticipation of exploding some Jurassic Park set dressing into thousands of LEGO studs using your awesome dino-jaws, you’ll probably enjoy this game well enough to buy it. If your reaction instead is to wonder how that actually changes anything at all in a series that has been spinning its wheels longer than most of its target audience has been alive, well, you might want to carefully consider whether or not you need yet another LEGO game. At the very least, Jurassic Park fans will probably be more open to the game, as it allows you to play famous scenes and characters from all four movies in the series. All the characters are here, and some of them even have new voice clips from the real actors. The rest rely on clips of questionable quality grabbed from the movies, and the two styles of voice samples certainly don’t mesh well at all. The gameplay is the same as most of the other LEGO games on iOS, such as LEGO Lord Of The Rings ($4.99) and LEGO Batman: Beyond Gotham ($4.99). You’ll guide a pair of characters through a level, fighting some enemies, solving some very simple puzzles, and smashing just about everything in pursuit of studs that can be used to buy new characters and unlockables. Each level hides some secrets in the form of Minikit parts and special LEGO bricks, but you’ll rarely be able to find everything on your first pass. Certain objects in each level can only be used by characters possessing a particular ability, and there are always a few objects you can’t access using the default set the game gives you. For those, you’ll have to return to the stages in Free Play mode. The main goal in each level is to make your way to the exit, but there are several sub-goals to shoot for as you play. Completing those sub-goals allows you to unlock various features in the main hub. When you start the game, you’ll have access to stages based on the first movie, Jurassic Park, and the most recent one, Jurassic World. The Lost World and Jurassic Park 3 are locked until you knock out a few sub-goals. There’s also a cool mode where you can mix and match dinosaur parts you find in the levels to create your own custom dino. The main hub takes the form of a sort of Visitor’s Center, and from there, each movie has its own tiny hub from which you launch the individual levels. Each movie gets five stages, though as with the handheld versions this iOS version is based on, those stages are broken up into separate mini-stages here. The separation of the stages doesn’t hurt here as much as it does in some of LEGO‘s other games, at least. The breaks are placed sensibly and the stages don’t really flow the way they did in, say, the console version of LEGO Batman. For the first time in a long while on iOS, LEGO Jurassic World is completely IAP-free. You don’t have to worry about any stud doublers or things like that. That doesn’t mean you won’t be grinding if you want all of the characters unlocked, mind you. But it’s the usual LEGO game grind that even the console players have to put up with, so it’s at least better here than it was in some of the earlier games. Developers TT Fusion have checked off all of the important iOS boxes, as well. There are a variety of control set-ups including gesture-based, virtual controls, and MFi controller support. Game Center and iCloud are both supported, as well. While I may rag on these games for the way they pull their designs back from the console versions, It’s nice to see iOS-specific features get proper attention. 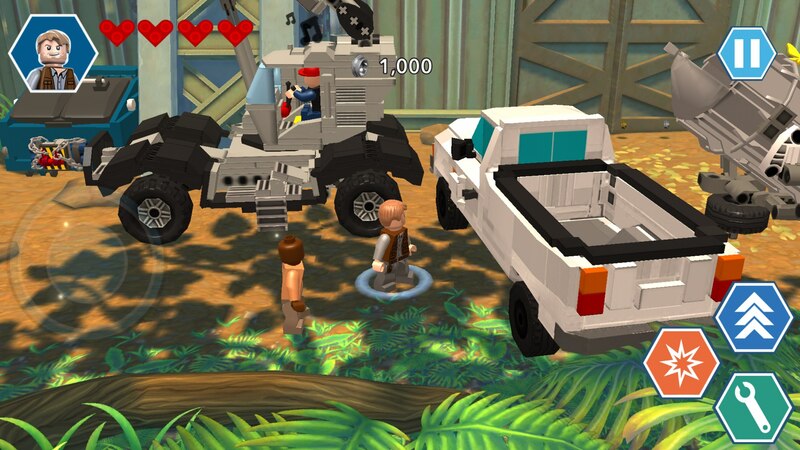 LEGO Jurassic World is par for the course for iOS LEGO games. Its lack of IAP and well-rounded features nudge it slightly ahead of the pack, but in terms of gameplay, level design, and all of the essential nuts and bolts that make up the actual content, its only form of distinction is its license. That license happens to adapt quite well to the LEGO game formula, and it’s treated well here, too. Simply having four movies to choose from allows the developers to assemble a pretty good collection of cool areas and situations. You’re still going to be doing more or less the exact same things you were doing ten LEGO games ago, however, so unless you’re a fan of the Jurassic Park franchise or the LEGO video game routine itself, you won’t find much to excite you here.